Today I'm pleased to having guest posting on the blog Gillian Phillip with part there of her exclusive story which features characters from the opposite of Amber. 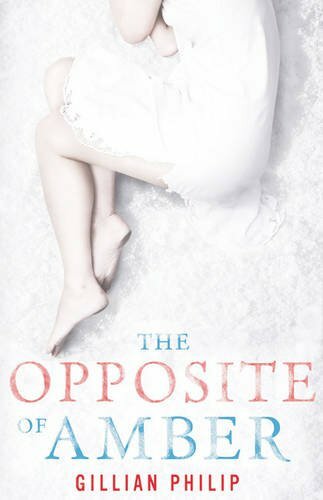 Check out my review of the opposite of Amber which was posted yesterday. It was a Saturday, so it’s not like we had anything else to do. We mucked about on the foreshore and did stuff I’d thought I’d never do again after I turned twelve: skimmed stones and counted the bounces; footered around in rock pools in our bare feet; kicked water at each other. I caught a crab and made like I was going to stick it down her cleavage, and she shrieked and yelled but she didn’t run very far. When I agreed to chuck the crab back in the waves, she came sidling towards me herself, biting back a giggle. I could only watch her eyes, and her teeth on her lip, and her hair outlined in sun like a halo. I didn’t feel so much like fooling around anymore. Not like a kid, anyway. I reached out a hand and she gave another little scream and danced back a couple of paces. ‘No, it’s gone,’ I said. ‘Honest.’ I held up my empty hands, then reached them out again. Tentatively, not quite trusting, she took my fingers. I pulled her in, ever so carefully. I kissed her and she kissed me back. As the sun vanished and the sea turned metallic, we sat on a dry rock, high up the beach. She was leaning back against my chest so I put my arms round her. I squeezed my legs tighter round hers, too. I was kind of reluctant to let her go home. ‘How did we not get together properly before?’ I asked. ‘Aye, OK,’ I interrupted, to shut her up. Her hair smelt gorgeous and strange, like Red Bull. She sank deeper back against my chest, and I thought she gave a little sigh. It was dark before I could let her go. We’d both got chilled sitting there on the rocks, so it was absolutely justifiable to wrap my arm around her as we walked. The pubs would be closing soon but right now it was quiet enough; the only sound was the tinny ring of the masts in the marina and the slop of water on the harbour wall. We stopped to look at the black water. That was my second mistake. Being romantic. I don’t know where the blow came from; I was only aware of it when I stopped falling through air and hit the water. My head rang so hard I couldn’t work out which way was up, and I floundered, bashing the side of a yacht, gulping water, till terror and freezing cold cleared my head. Wildly I grabbed the jetty, and hauled myself out. I still couldn’t stand up straight. I shook my head, and then I was scared to do that in case my brain came loose. And then, finally, it cleared. I was terrified, sopping cold seawater as I fumbled my way up the steps to the quayside, and I thought about running away, but I didn’t. There was muffled squealing in the darkness near the trawlers, and the noise of an undignified struggle, so that’s the way I went, still dripping and staggering a bit. The big gype from the beach bar. He had his hand over her mouth but Jinn was kicking away at his legs and he was far too busy fending her feet away from his goolies. I just ran at him, barged hard into him so he stumbled, but he didn’t stumble enough. He was back upright and trying to land another punch on me, and when I dodged that he grabbed me, first by my sodden hair and then by the throat. You wee snot-rag,’ he roared. I thought I was dead till my eye caught the flash of cold light behind him. I couldn’t shout but my eyes must have widened convincingly because he flung me down and spun round. It was only a kitchen knife and she wasn’t even holding it right. He knocked it out of her hand as she flailed at him, and he went to hit her, but I was moving faster now. I rolled and grabbed it. Dropped it, grabbed it. Shambled, half-crouching, to the struggling pair, and stuck the blade in the big gype’s side. Aaaaargh, oh no, Gillian, don't stop now!